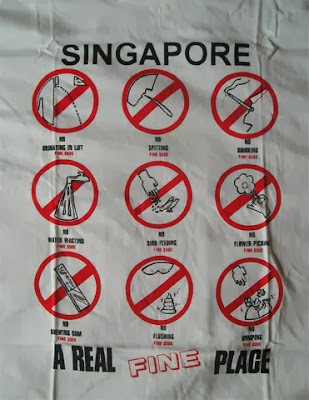 Having gone to Singapore before fining a lot of stuff above makes it a real fine place. Some people call the nation as a humans right violator but in reality, their policies actually protect freedom. Having gone there 16 years ago for a tour with my relatives there, I have noticed how different the place was and how it makes a difference to have strong law enforcement and how it protects freedom. It does not repress freedom. Many things that we consider as "freedom" are actually crime at best. When you think of it, just think of how much freedom you have when there's no smell of pee in the wrong places, not much to worry about bacteria spreads, people who smoke in in appropriate places (plus it's better for the environment), water is conserved, no hoarding birds, flowers can bloom on their own, no gum sticking anywhere, the public CRs are well maintained and think of it, no garbage litter makes the place more free to enjoy its surroundings. In fact, when people practice decency, it becomes a good place. I believe that making offenses like peeing everywhere and spitting everywhere an offense worthy of a fine, people will think twice before throwing in such disrespectful action which can ruin the fun of others. Was it a violation of human rights to sentence Michael Fay to jail and have him caned? No, I think not. He wasn't only cutting classes but also vandalizing and destroying public property destroys freedom of others. I mean, I wouldn't want the car that I bought to be just vandalized by hooligans, I want to enjoy its value and I want others to enjoy the fruits of their labor too. The caning of Michael Fay should serve as a lesson that it's not cool to destroy property of others. People worked hard for them so why destroy them? The same applies for Flor Contemplacion. When Singaporean authorities took action on what she did, who knows how many honest to goodness Filipino workers were saved in the process. There might be another Delia Maga among honest to goodness Filipino workers. When you think of Singapore with all these policies, they are actually human rights protectors. Think about it, a Singaporean man who hit his Filipino maid (thankfully no serious injuries) went to jail for a month. If that incident happened in the Philippines and the person was rich, they could pay their way out but not in Singapore. Foreign businesses get to have 100% ownership as long as they abide by laws. They don't plead for guilty Singaporeans abroad to protect the state from criminals they themselves admit that they failed to arrest. Now are those human rights violations? Just my thought only if the Philippines can learn from how developed countries are, they can actually see progress. Sad to say Pinoy pridists have the wrong definition of freedom which can be evident in the slums and other poverty driven areas. Fortunately sensible Filipinos are keeping the Philippines from totally falling apart into a poorer than poor third world country. And how is this protecting the people--the adult citizens? Did you know that Singapore is one of the unhappiest countries in the world? Sure it's a great place to live, and I feel safe, and I love the culture, but the citizens here are miserable. You'd fit right in with the government though, Sean.